As we enter into quarter two of 2019 I see that blogging once a month has become my norm (I apologize) and that my resolutions for 2019 remain unset (I will not apologize for this). I have decided I am forgoing setting goals for 2019, both for my life, and my business. 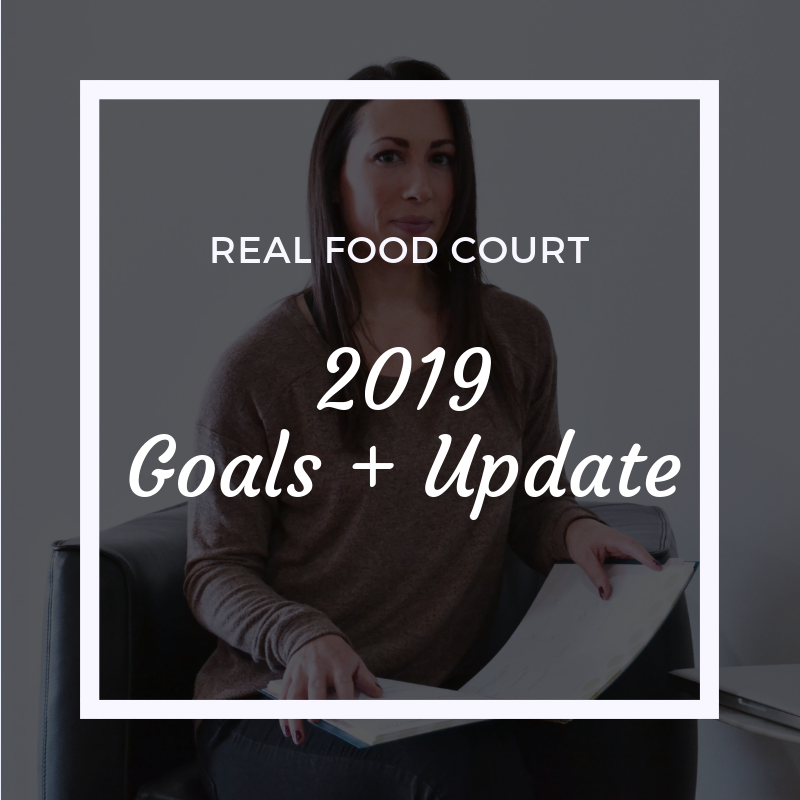 If you read my January post you read about how much success I had in 2018 both with meeting and exceeding many of my goals. But, 2019 is proving to be the year of slowing down. Right now, I do not need goals to push myself and achieve and challenge myself, I need to slow down. This post is let you know where I am at, and what I am focusing on. I hope it helps you be ‘okay’ with whatever your choices are. Whether you are choosing to make this a year of hustle, a year of family, a year of love, whatever it is, it is yours to choose. I certainly am periodically panicked that I ‘should and could’ be doing more. But then I remember, I am enjoying the less doing and more being. I also remind myself that those things are available to me when I want them. I know how to hustle, if I want to start pushing my limits I can certainly flip that switch. For now, this break is okay. I hope you will share your 2019 updates with me and of course continue to follow my journey on IG where I share daily. Below are some updates on what I have been up to and enjoying. Focusing on my job. My new job has proven to be a great outlet for my skills and passions and as a result I feel less drive (pressure) to do ‘all of the things’ outside of work. Work is more fulfilling, and that is a positive. Getting married. I am getting married in just over 5 months and while we aren’t doing anything crazy, it is still WORK. We have weddings to attend, family functions, events to plan, and details to organize. That is enough for my to-do list for the next few months, thanks. Hanging out with my nephew. Because he is cute. Exercising. I joined a gym for the first time in several years. It is fun to get back to lifting heavier and also rediscovering what my best ‘balance’ of lifting, running, walking, yoga, barre, etc really is. I love experimenting with my body. Therapy. This is new to me but has been great. Reading. So. Much. Reading. If you are following me on IG you are following along with my reading and my audiobook listening. I set a goal of 50 books completed in 2019 and I am already just about halfway there. Reading is great because instead of stressing and finding ‘things to do’ and things to worry over, I take any moment of free time and open a book. Teaching group fitness. I am teaching at InlineFit in Canton, Baltimore 3 classes per week + subbing and recently started picking up some Saturdays at LIFT in Mt. Vernon, Baltimore. These classes are a highlight of my week. My InstantPot. (DuoPlus 6 Qt.) Really working on spending more time enjoying my time in the kitchen. Turns out when you don’t overfill your life it is a lot easier to find enjoyment in cooking. So thats my 2019 trajectory. Nothing crazy. No big goals. Just lots of things going on and I want to enjoy and be present instead of stressing over the week or waiting for stressful events to pass by. I hope you continue to enjoy my content, even if the pace is slowed down. As usual, if there is something specific you want to hear about LMK! How was your February? Two weeks ago me and my friend, and fellow RD, Becky went one week without added sugar. Did you join us? If you missed the challenge, you can find the details here. 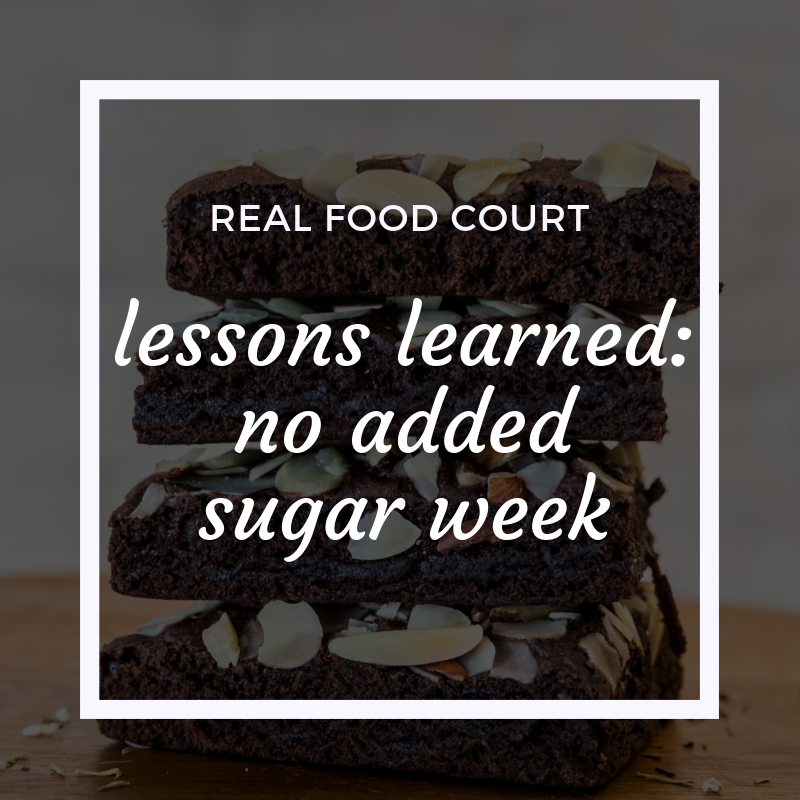 Today I am sharing some of the lessons learned during our brief seven days without added sugar. Don’t worry, I am back on the donuts, but it was a great, eye opening challenge. Too much sugar can make you feel crappy and can aggravate IBS. Added sugar is in SO many foods. Truthfully, I tend to think my added sugar intake is fairly low day-to-day (unless I bake cookies or am PMSing) but, getting reacquainted with the food label on staple foods in my diet made me realize that I likely come very close to the ‘recommended’ added sugar limit of 25 g/d. Between sausage or bacon, a granola bar, bread, sauces, and so much more, sugar is literally everywhere, and often in places it really doesn’t need to be. Eating sweets can quickly become a habit. We found that nighttime snacks and post dinner treats weren’t really something that was needed or even really wanted. Sweets are often used to comfort when stressed, or occupy when bored. Yikes!!! I am all about mindful eating, I really try to think before I eat and this challenge helped me identify the moments when I normally would reach for some m&ms or chocolate in the cabinet. This challenge forced me to check-in. EVERY SINGLE TIME I had that urge it was due to looking for a distraction from something I didn’t want to do, or feeling stressed / overwhelmed and wanting a moment of comfort. I prefer intentional treat selection for enjoyment, but I am not immune to the comfort of my favorite chocolate to escape my stress. I definitely do this way more often than I realized and I am glad for my better awareness. Now I am more apt to stop and ask ‘what am I really feeling right now?’ It is challenging, but powerful. A savory breakfast can be just as satisfying as a sweet breakfast. PS Becky has some amazing recipes and breakfast shares on her IG so make sure you’re following her. Fruit makes a great dessert! We both really enjoyed adding more fruit to our day, either at breakfast, as a snack, or as dessert after a meal. Clementines and grapes are extra tasty this time of year and are certainly sweet! Carbohydrate intake didn’t decrease. This eye opening experience showed us that we do love carbs and can eat carbs and will eat carbs for fuel and satisfaction but perhaps the countless sources of added hidden sugars in our diet don’t all need to be there too. I rely on bread a lot more than I ever have (due to my schedule) and I recognized there were higher quality breads I could invest in for more nutrition and less / no added sugar. Not drinking alcohol is tough. We had an alcohol goal, I did not succeed. Some weeks I drink 3-4 days, some weeks 1 day, some weeks 2 days. I wasn’t going to give up on a social outing and seeing friends because of this challenge. If I am out and socializing I prefer to drink. If I didn’t want to drink I would stay home and read. Worth highlighting two big points here: 1) Your alcohol intake isn’t benign, I know about my relationship with it, what’s yours? and 2) Your diet choices should not limit your social life and enjoyment of life. And of course, as I always say, it is important to be able to enjoy a treat when you want it and when it is special. Sweets are for enjoyment, not just because you realized your taxes are almost due and your anxiety is thru the roof. My biggest take away, was to remind myself of this exact thing that I know and teach but can sometimes lose sight of. Choose the treats that matter, that are chosen for the sake of truly tasting and enjoying, not the treats that are used to numb. Well guys, there you have it. We survived, we learned a lot, we have new ideas for snacks, and a greater appreciation for why we make certain choices. Are we both back to eating sugar? You bet, however I always appreciate a learning moment and ideas about how to be more mindful and I look forward to using these lessons moving forward. Tomorrow, February 18 thru February 24 I am doing a no added sugar week. My kitchen is full of sugar too, rough. But WHY?! You might be asking. And before you shun sugar as the devil, or get on your intuitive eating high horse, hear me out. This came about via my usual text thread with my good friend and fellow dietitian Becky (follow her on IG here). We were both complaining about sugar. Some of our common complaints include: eating more sugar than feels comfortable; post-sugar intake digestive distress; feeling trapped in a sugar habit; finding comfort in sugar. It seems like since the new year started it has been worse. We both have a lot going on personally and professionally, but just like turning to alcohol won’t solve your problems, neither will turning to sweets. Talk about a reality check. We both know these things. We are both active, we eat well, prep food for the week, and take care to get as much sleep as we can. We treat ourselves well, yet we were letting sugar run the show more often than we cared to admit. We decided we would hold each other accountable to a little break. The intention of our added sugar break is this: to stop using sugar in ways it shouldn’t be used. When we’re upset or stressed, instead of reaching for that sweet, we will be literally forced to try another avenue. We will stop, think (this is huge), and make an intentional choice. Instead of reaching for whatever chocolate is in the cabinet, we will choose from more intentional, and honestly more helpful habits like calling a friend, going for a walk, meditating, doing a face mask, or taking a bath. We don’t think sugar is the devil. But, we prefer to have the ability to make the choice to eat sugar out of mindfulness and choice, not stress. Once our followers expressed interest in joining us we knew we had to write a post in case more people wanted to join. If you feel like you turn to sweets for any reason other than pure enjoyment I hope you will join us this week. See our guidelines below. No added sugar for 7 days. We are doing Feb 18- Feb 24 but feel free to pick seven days that work better for you. No added sugar includes things like maple syrup and honey. Fruit is okay. Fruit has natural sugar, use it for dessert, post workout refuel, or a more natural way to settle a true sweet craving. Dates are an unsweetened fruit, so use these as you wish! Carbs are okay. Just need to remind everyone of this tidbit. We aren’t doing a Whole 30 or anything dramatic. Literally, just tuning in before we use sugary sweet treats to tune out. Basic components of a nourishing diet should stay put. Alcohol is okay - in moderation. We decided on no more than 2 drinks at a time and no more than 2 days this week. Cutting out alcohol didn’t make sense to us because we enjoy our social life and seeing friends. If you prefer to cut it out totally, you do you. Get a friend to join you, an accountability partner, and someone to call when you’re having a freakout stressful day, is super helpful. No artificial sweeteners. I won’t get into why I despise artificial sweeteners here. Just know that they are definitely out. Be mindful. Thats the point of this challenge after all. To think before you eat. See what comes up for you. Is your trip to the cookies after work truly a desire for cookies? Or maybe it has become a way to decompress after a hard day? Are the never ending sweets at work really impossible for you to say no to? Or do you use that as an excuse to eat things you don’t even really like that much? If you are ready to join us on this challenge and take control of your cravings then comment below and share this post with your friends. Remember, enjoying sweets isn’t a bad thing, but most of us use sweets outside of pure enjoyment and instead to play some role or manage some emotion that could be better filled and managed elsewhere. Lets reconnect to what is really going on in our mind, and to what our body truly needs. Can’t wait to see your journey!! You can tag us on social media @realfoodcourt @becka_rd on Instagram to share how your week is going.